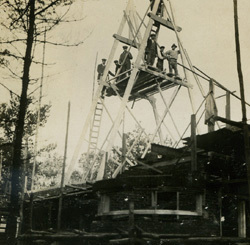 Construction photograph, 7 Oct. 1924, positioning of trusses on the high roof. 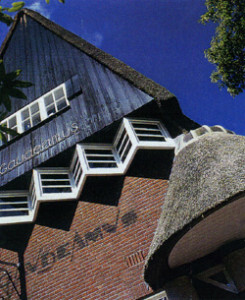 Villa Gaudeamus in Bilthoven dates back to 1925 and is the first executed design by Julius’ fifth son Frants Edvard (1904-1980, architect and amateur flautist). The Röntgen family therefore also referred to it as his ‘opus 1’. There is a persistent story that the house is supposed to represent a grand piano with its lid up. The architect himself however has always denied this, as have his friends and family. 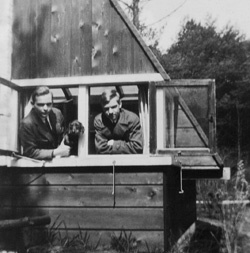 Frants Röntgen (left) in his studio with his brother Joachim. Röntgen was influenced by well-known architects of this school, such as Wijdeveld, Kramer and especially De Klerk. It is not unlikely that the high roof of the house was inspired by the steep dunes at Catrijp, near Schoorl, the area where Julius Röntgen spent many holidays during the period 1914-1919 and where he would have liked to have lived initially. The garden house from 1928 is suggested to have been Julius’ composing house. That story is also incorrect. The architect had designed a study for his father in the country home itself, including a small cupboard drawer for his pipe and tobacco pouch, and with a grand piano. Frants had designed the garden house for himself, by way of a studio. The house was a meeting point for family, friends and acquaintances. All the sons from the second marriage had their own room there! A great deal of music was played there and Julius Röntgen taught analysis courses frequently, which were attended by many interested parties. During these courses all genres were touched upon: opera, oratorio, music for orchestra, chamber music and piano music. Works which Röntgen greatly appreciated or of whose importance he was aware. Judging by the subjects he taught about, it appears that he was open to new developments: apart from the big classical masterpieces Mahler, Richard Strauss, Wagner, Debussy, Ravel, Stravinsky, Pijper and Hindemith were also dealt with. After Julius Röntgen’s death in 1932, Röntgen’s second wife Abrahamina (Mien) des Amorie van der Hoeven stayed on in Villa Gaudeamus until she herself passed away in August 1940. After Mien’s death the inventory was shared out among the next of kin. Frithjof, son of violinist Julius Röntgen jr. inherited the Bechstein grand piano, whereas Mien’s Steinway grand piano went to Edvard and the viola to Joachim. At the beginning of the war the house was vacant for some time until is was rented by a young man, Walter Maas, who was looking for a suitable residence for his Jewish parents, his younger brother Ernst and himself. Around Christmas they started a guest house “just for Jews”. Father Maas was a prosperous wholesaler in wine from Mainz, his son Walter a textile engineer. During the war Walter lived in Gaudeamus until March 1943. When the persecution of the Jews erupted in all its intensity he hid away high up in the house in an extremely small space for more than nine months. When that also became too dangerous he sought refuge at several different addresses. His brother Ernst had a lucky escape by way of his marriage to a Dutch, non-Jewish woman. His parents were killed in Sobibor, although the sons were not informed of this until 1946. Directly after the end of the war the mayor of De Bilt saw to it that Walter could take up residency again in Villa Gaudeamus. During the last war years the house had been used by the SS; the oil trails of the motor bikes parked in the hall were still visible. The Germans had left the house in a terrible state, but by pulling out all the stops Walter manages to reopen guest house Gaudeamus. In October 1945 Julius Röntgen jr., the eldest son of the composer, requested if he could give a concert in the former house of his parents, much like his father used to. There was a huge interest; according to the stories there were hordes of people outside listening. During the war Walter had already had a plan to do something in return for all the help and support he received from the Dutch. And that evening he knew: the house would be at the disposal of Dutch composers free of charge, his contribution to the cultural reconstruction of Holland and the cultural life in Bilthoven and surroundings. In 1947 Walter Maas bought the Röntgen house. Shortly after he founded Stichting Gaudeamus, the ‘Foundation for the promotion of contemporary music’. He wasn’t a musician himself, but due to his organisational talents and his legendary perseverance Walter Maas and his foundation saw to it that contemporary music flourished in our country. Because of unrelenting phone calls (the telephone can still be seen in his office), endless correspondence and his charisma in particular many composers met each other here, in this house: Louis Andriessen, John Cage, Ton de Leeuw, Olivier Messiaen, György Ligeti, Peter Schat, Karl-Heinz Stockhausen, Edgar Varèse, Reinbert de Leeuw. Until his death in 1992 Walter continued with his guest house, managing to combine it with his activities as ‘an estate agent in music’. Not much is left of the guest house; there were quite a few rooms and smaller rooms and no less than seven bathrooms. On the first floor there are still some doors with numbers on them. Highlights in those years were the International Music Weeks. Furthermore, the Nutcracker Campaign caused a great deal of controversy, when composers used squeezy-frogs to disrupt a concert as an expression of the revolutionary upheaval in the music of the 1960s. In 1992 Walter Maas died. His ashes were placed in the patio wall at the rear of the house, behind a memorial stone. His brother Ernst, the only heir, bestowed the house on the Maas-Nathan Foundation, named after both their parents. Since 1993, the house, renamed as Walter Maas House, -guided by the inspiring direction of Bart van Rosmalen- has developed a country estate for cultural explorations and a meeting point for composers, musicians, scientists and people from trade and industry. In 1998-1999, the residence was brought back to its original state and splendour by architect Diederik Six. The house then acquired the status of State Monument. Unfortunately, the Walter Maas House was unable to continue its activities due to severe cuts in the national budget for The Arts of the Dutch government in the years 2010-2012. The present owner is the Foundation Walter Maas House. This organisation preserves the house as a unique place for workshops, conferences and concerts, with a maximum capacity of 50 persons. 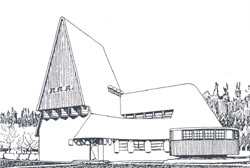 For this text an article by Jaap van Trigt about the history of the Walter Maas House was consulted.